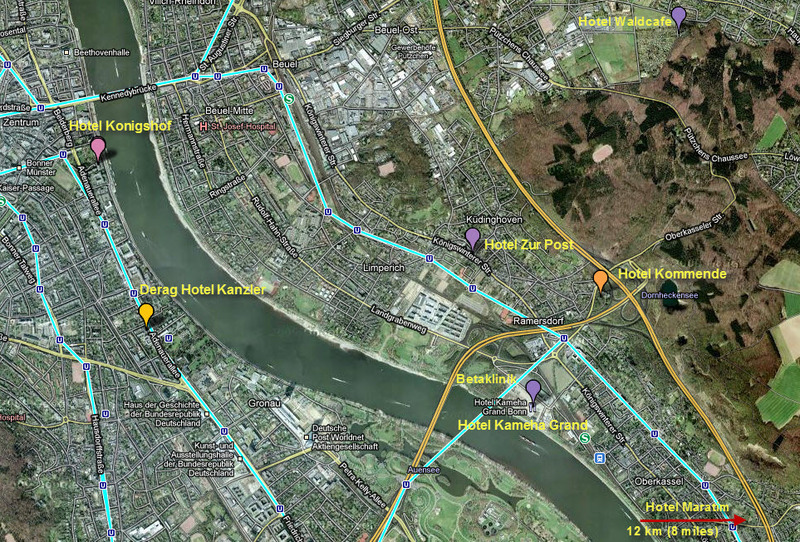 All that is working so far is the hotel map below. This lists the hotels recommended by the BetaKlinik. If you click on the picture, you'll get a pdf file that has clickable links to the hotels' websites. Welcome to the BetaKlinik / Bonn section of the iSpine travel forums. This service is hosted by Global Patient Network and iSpine. As we accumulate more and more information here, these forums will help to make sure that you know what you need to know in order to make your trip less stressful and more successful. Things like understanding the pharmacy system and how to get prescriptions filled after hours may be very important to you. Understanding your hotel options and suggestions for restaurants and sightseeing will help to make your trip more pleasant. Taxi Service Pone number from Stadt Bonn - Startseite here. Last edited by mmglobal; 11-29-2010 at 06:57 PM.